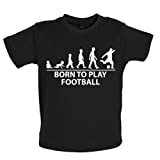 Born To Play Football Baby T-Shirt. Made from 100% Cotton, this T-Shirt is available from ages 3 months up to 24 months. Available in EIGHT colours – Black, Bubble Gum Pink, Camouflage Green, Dusty Blue, White, Red, Nautical Navy and Mint. Dispatched by 1st class postage to UK buyers, usually next working day. Black 6 panel baseball cap, Now Available In 6 Colours. This entry was posted in Soccer and tagged Ages, Baby, Born, Colours., Football, Months, Play, Shirt, Toddler by FPSports. Bookmark the permalink.